‘Sniper the Boss’ seems to be, to me at least, the forgotten man from Frank Warren’s stable of fighters and I mean that in the nicest way possible because for someone of his talent he’s getting very little in way of opportunities from his promoter. Campaigning at super middleweight, the 25 year old looked like kicking on when he won, Warren’s trademark, WBO European title in November of last year but since then his progress has stagnated with just a single six rounder to his name this year. None of that is Richards’ fault who, earlier this year, told me he wanted a shot at the English title by the end of 2018 and you’d suggest, certainly, on his talent that he is a man more than deserving of such a fight. Incredibly mature in the ring with a strong, established jab and fantastic amateur pedigree, Richards is a commanding presence at the centre of the canvas, working the angles, cutting of the ring with ease and packing a ferocious left hand. Having sparred with the likes of George Groves and Lerrone Richards there can be no doubting his class in the ring and, hopefully, it’s only a matter of time before we see him getting the opportunities he deserves. It sounds like something so simple but ‘Top Boxer’, as he’s known, really has mastered Twitter and YouTube in order to connect with his fans – myself, included – and whilst I’ve wanted to interview him for quite some time, I’ve not managed to do so yet, his manner in everyday life makes it, near, impossible to not want him to do well. That’s all by the by, however, what really matters is his ability in the ring and having come from a strong amateur background he already looks at ease, moving through the motions quickly, and stamping his authority over his three opponents thus far. Targeting a clash with “Chihuahua” Darryll Williams, Sadiq looks likely to face Zak Chelli next in October but his rise to the top is surely going to be as quick as it will be stylish and sophisticated. Explosivity personified, Dan Azeez is part of Britain’s burgeoning light-heavyweight scene looking to force their way into title contention and with the Southern Area belt currently vacant then your money would be firmly on Azeez to be the next champ. Backed by the big boys at MTK Global, Azeez dropped his first three opponents a total of six times to instantly raise the eyebrows of many a fan and fighting with such fierce regularity – September 21st will be his fifth fight in just over six months – ensures that his development is constant, he’s always learning, there is no standstill for Dan Azeez. And that last fight, on July 13th, against Adam Jones was a fight where you could see Dan thinking on the job, having to adapt, you could see all his training coming to the fore because, as much as I wanted to see a fourth knockout on the trot, Jones was awkward and forced Dan to go one step further than his comfort zone and, ultimately, it’ll pay off in the long run. Stepping up to six rounds in his next outing, I’m torn between whether I want to see more of that vicious punch power – which we all know Dan possesses in spades – or if I want to see him in with those opponents that are going to be awkward, aren’t really going to come to fight because as boring as that sounds and as bad it would be, these fights are going to test Dan but my money says, regardless of opponent, he will always find an avenue to launch that knockout shot because he is just constantly thinking, he’s a smart boxer and I, for one, cannot wait to see him knocking on the door for those titles. Southern Area middleweight champion Tey Lynn Jones makes this “prospect” list despite already being quite established in the domestic scene because, to be honest, he has just got bags and bags of potential. 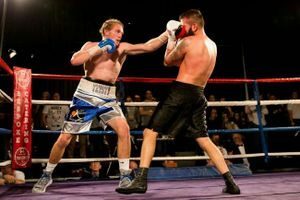 In claiming the Southern Area crown against MH Legg earlier in the year he looked destructive, dropping Legg in the first round and easing his way to the win – Legg retired after the seventh – but his first defence, against Darren Codona was, by reports, not entirely convincing. Now I don’t mean that to sound horrible, you’re allowed off nights, and having first seen Tey back in February 2017 it would be impossible to deny just how far he’s come in that, relatively, short space of time. ‘Teysty’ is no longer rushing his shots, he’s taking his time and remaining patient but, in equal measure, he’s not afraid to go for the stoppage when there’s blood in the water and he’s always looking to exploit his opponents weakness – I think that’s, for me, one of the most tell-tale signs that the 24 year old has learnt SO MUCH since his loss to Nicky Jenman in March last year. He’s gone away, worked his nut off, thought “okay, how can I get better?” and is now reaping the rewards so hat’s off to him and for as long as he stays in these title fights then he’ll always be pushing himself to get better and there’s some real good opportunities out there for the Essex man to push his name up the rankings. Now Chris Billam Smith is a man I have been excited about for a long time and I know Barry McGuigan shares that excitement so the young cruiserweight must be doing something right! I’ve said it before but the Bournemouth man has a style that makes you want to watch him, his fast footwork makes him hard to hit but his long, lanky – in a nice way – stature means you’re seemingly never out of his reach and when he starts to get into his rhythm he packs one hell of a right hook. A fighter who prominently targets the body of an opponent, Billam Smith has mastered the art of teeing up the shot with sharp combinations to the head before dropping down and slamming home that right hand into the ribcage of his opposite man. Last time out the 28 year kid faced Michal Plesnik and was convincing on his way to securing a shut-out points victory over eight rounds, setting him up nicely for title challenges and I like that every time you see him out in the ring you see his boxing maturity, he doesn’t rush shots to try to force the stoppage but is patient in working the angles and that is a characteristic that, more often than not, brings success. I trailed this piece on Twitter by asking what these guys had in common and whilst I’m sure they’ll probably have quite a lot in common, the main factor is that they’re just ridiculously good fighters so make sure you keep an eye on them before the whole bandwagon rolls in.